Do you feel that your family is not what it used to be, or what it has the potential to be? Do you worry that the parenting decisions you’re making today may be scarring your child for life? Do you sometimes feel you are in a tug of war with the world over who will shape your child’s values and beliefs? Dr. Phil has been working with families for over 25 years to help them repair the fissures that have fractured their home lives. In Family First, he provides a proven action plan to help parents determine the strengths and weaknesses of their parenting style. His 7 Tools for Purposeful Parenting cover the most important elements for any parent: parenting for success — for the purpose of raising cooperative, caring, and competent children. 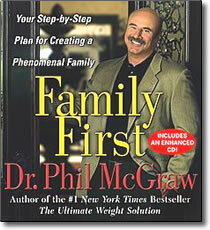 Dr. Phil shows parents how to make changes now — how to put a stop to your children’s tantrums, talk to them about peer pressure or self-esteem, instill values like integrity, honesty, and respect for other people and bring order back to your house. If you want your child to have a happy, fulfilled life, you must open your eyes to the crucial role you play in his or her development. Family First offers you and your family hope — for a phenomenal home life now, and a productive, fulfilling future for your children. As Dr. Phil says, you are not raising children you are raising adults, and everything you do today impacts what kind of adult your child will become. You are building the future.